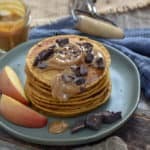 Vegan Pumpkin Pie Pancakes! Light, healthy, delicious and super easy to make. No dairy. No oil. No refined sugar. And, extremely low in fat. Heat a nonstick griddle to 375 or a large nonstick skillet on medium heat. Whatever you use, allow to COMPLETELY heat before using. It usually takes about 4-5 minutes to completely heat, but every appliance is different. Combine milk and vinegar. Whisk together until it bubbles. Set aside while you combine other ingredients and allow milk to curdle. This will be like buttermilk. In a large mixing bowl, add all the dry ingredients and whisk together until well combined. Set aside. Using another bowl mix the pumpkin and maple syrup together. Add to the dry ingredient, but don’t mix…yet! Add the “buttermilk” and applesauce. Whisk everything together until it looks like pancake batter. If you want fluffier pancakes, leave some lumps and don’t over-mix. If you want your pancakes a little more dense, which is how I like them, whisk until the batter is completely smooth. Spoon a 1/4 cup of the batter onto cooking surface. Cook the pancakes until bubbles appear in the center or the edges start to brown, usually about 45 seconds-1 minute. Flip and cook for another minute and they’re no longer doughy in the center. Serve these bad boys with whatever you want: maple syrup, fresh fruit, nuts, non-dairy chocolate chips. It’s your world, do what you want. FYI, these pancakes are not super “fluffy” like some pancakes. If you want them a little fluffier, simply add more flour until you get the consistency you desire.